Smiley Faces, Twister, the Village People, Saturday Night Fever, Studio 54, Rubik’s Cube – there were some fantastic cultural trends in the 70s. As such it’s a great decade to celebrate with its crazy fashion, outrageous icons and excellent music. 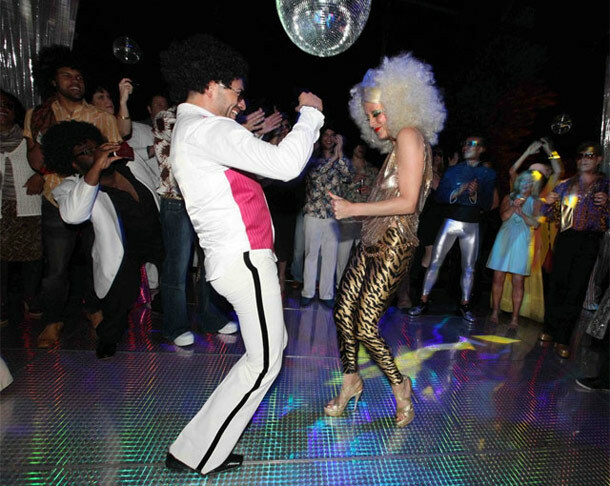 It’s not hard to take on the 70s theme, with well-chosen lighting, music and props. Thrift shops and party warehouses are superb places to buy decorations and props. 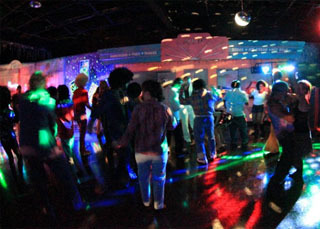 And you can hire a selection of 70’s lights and a user-friendly audio system to complete the setup. Use your décor, lighting and music to set the scene. Select a combination of 70s lighting to create that perfect backdrop for the flared trousers, big hair and funky disco moves. 70’s lighting revolves around the mirror ball – no pun intended! Usually these are mounted in a central point of the party to create a centerpiece. Fire two or more pin spots at the mirror ball and watch the diamond shafts of light firing into every corner. Mirror ball clusters can look the bomb where several balls are hung together. Read our article about mirrorballs to get some further ideas. Black lights are awesome to create that ‘glow in the dark’ effect. These can be hung or floor mounted, to create a surreal entranceway effect or a peaceful zone to relax in. You can get LED black lights now that are a lot easier to handle and operate, but the original incandescent UV lights are also still available for the authentic effect. Many LED UV options are still not quite as good as the real deal. Oil wheels started as a psychedelic 60’s effect but were as popular in the 70’s, and are still widely used today. They look brilliant projected against a blank wall with all of the swirling, dripping colours. Lava lamps are another classic icon from the 70s and can be purchased from discount outlets for a fraction of what they used to cost. Place in discreet areas on low tables for some hot lava action. The strobe is another cool effect and when used in short bursts adds an exciting dynamic to any dance floor. These can be adjusted in terms of sensitivity, flash and duration and some have intelligent control options if using DMX. Try using a bright orange or purple gel over the strobe for a groovy effect. Lasers became popular in the 70’s with rock bands using them as a form of psychedelic entertainment. Now they are a highly affordable option for hire or purchase, with loads of rich colours and different effects available. Remember to always use with a fog machine for the best effect. There are heaps of websites online that can help with your music choice. Download or buy some 70’s themed compilations and get some active speakers to play your music through. Or why not hire a Karaoke machine, load up your 70s favorites and really get the party started! Top 10 tips on lighting up your band or performance – Have you got the edge? (part 2)Top 10 tips on lighting up your band or performance – Have you got the edge?